Kudos to the marketing team that invented the gift card. Money? That’s a crappy present. But a gift card that limits your options? Perfect! Jeff Havens is not your typical business growth expert. His uncanny ability to provide actionable answers to today’s business challenges in an undeniably entertaining and impactful way has put him in front of over 1,000 eager audiences across North America and Asia. Delivering well-researched and relevant business insight is something a lot of keynote speakers do, but combining that with the entertainment value of a comedy show is not. 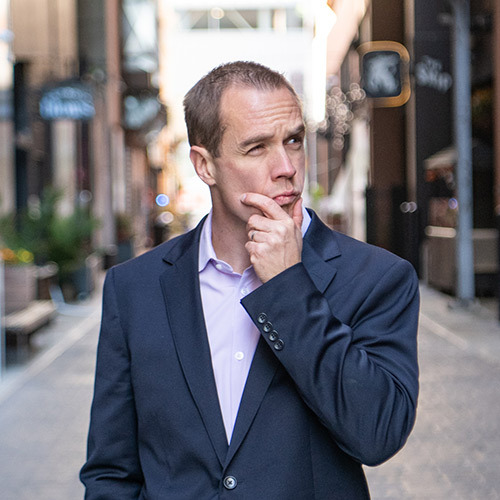 Engaging, charismatic, and full of energy, Jeff Havens is the only business growth expert who provides serious solutions in a seriously funny way. But even more than that, Jeff makes things easy. All of us are constantly being asked to do more with less, so the last thing you need is someone to tell you how difficult your challenges are. Jeff has a unique ability to simplify seemingly complex problems in a way that will provide your audience with a fresh perspective, one that runs counter to the conventional wisdom of the business world. He’ll show you that we’re not actually creating a completely new type of person every 15 years, and that being innovative is not something only a few special people know how to do. Both exceptional leadership and customer experiences are built on surprisingly slender foundations. You will leave Jeff’s keynotes refreshed, relaxed, happy, and more confident than ever, feeling prepared for the road ahead. “Oh my goodness, he was a humongous hit!! We had a stellar lineup of speakers. Jeff was hugely popular! The conversations that festered the afternoon after his talk, about everyone’s experiences with tyrant bosses, was epidemic. Jeff is fantastic!! But he also got people thinking. His unique approach lingered and stuck with people. Our audience raved. Jeff had a breakout the next day after his keynote. It was literally “standing room only.” There was nowhere left to stand! We should have anticipated that the capacity would be more than triple what was registered for his session. Good thing the fire marshal wasn’t there.